Christmas Morning Pancakes. 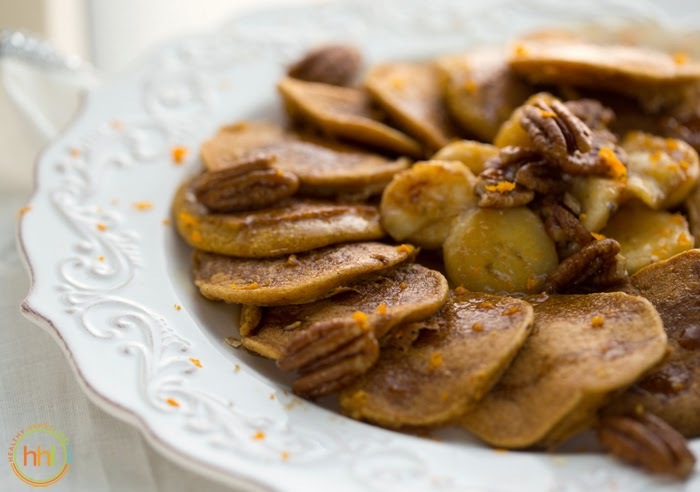 Pecan-Citrus-Spice. Gluten-Free. These are them. 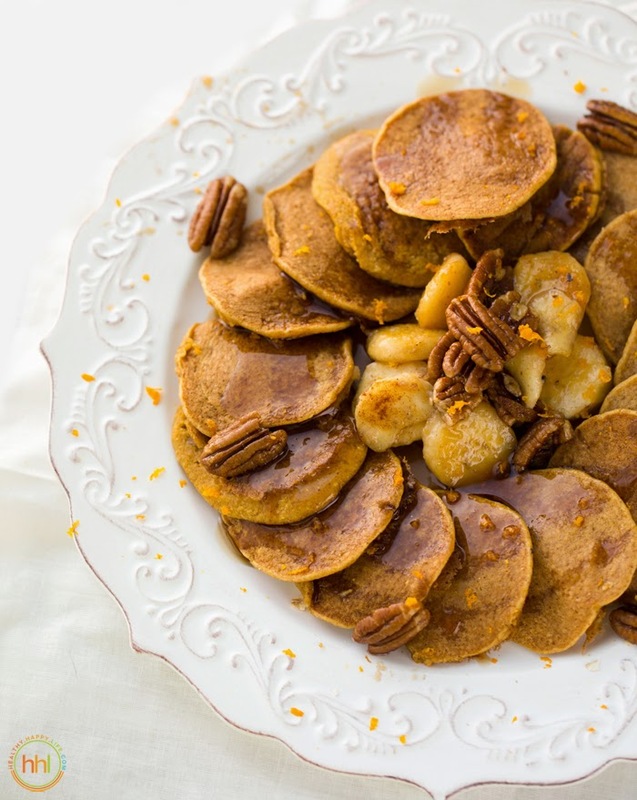 These are the pancakes you want to make on Christmas morning. I should know because I just taste tested them for you today, on a non-holiday morning, and they were blissful. So I can only imagine how much better they will taste (if possible) in between opening presents, listening to holiday music and feeling that cozy, happy Christmas morning feeling. Flavors. Citrus. Spice. Vanilla. Pumpkin. Pecan. Maple. 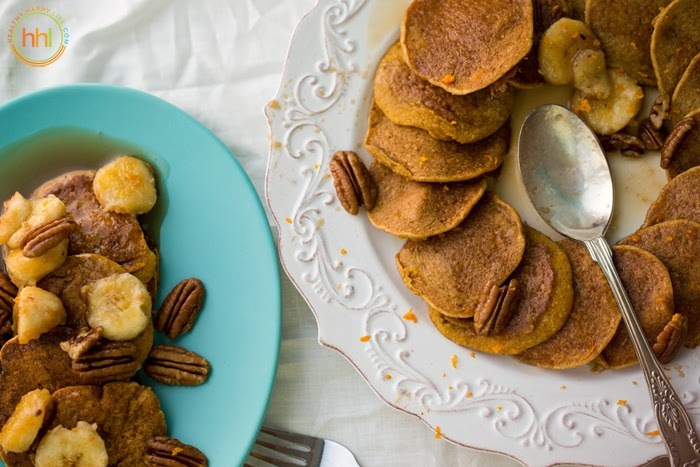 These Christmas Morning Pancakes are a big warm hug from me to you. Oat flour-based, and packed with festive flavors. Totally gluten-free, yet still fluffy and delicious. And ps. If you want to use regular flour in place of oat flour, you can do that too. 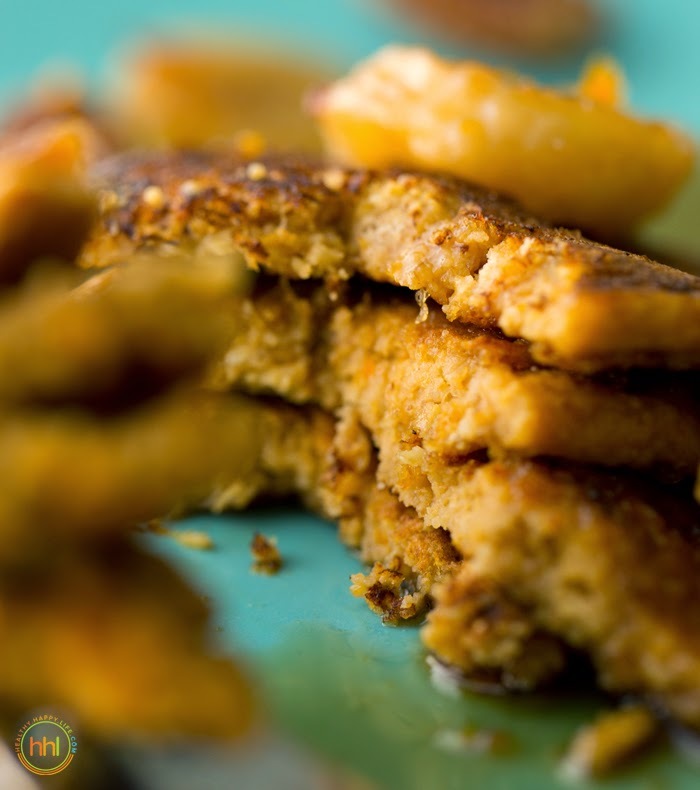 Get my recipe, plus my THREE tips to gluten-free pancake-ing.. These are pretty fabulous, if I do say so myself. Make a big platter for your favorite family on Christmas morning (or any day really) and watch the smiles grow like mushrooms after a rainstorm. Wait, that was a weird comparison, but lets just go with it. Golden little rounds of yumminess. 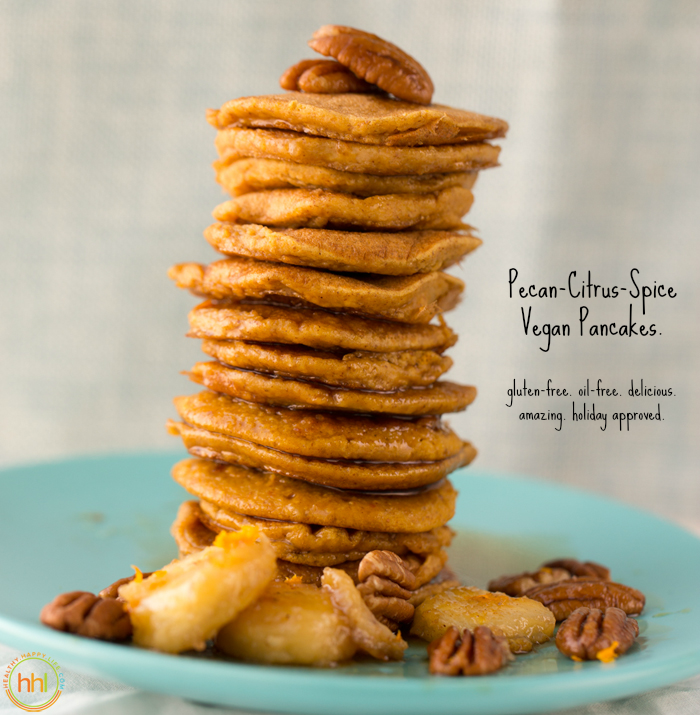 Gluten-free pancakes can be quite lovely! They have a unique sponge-cake like fluffy texture I love. And speaking of Christmas. DO NOT forget to enter this giveaway guys. I would LOVE LOVE if the winner was one of my readers, how cool would that be! I cannot wait to see who wins, I mean $2,700 in amazing vegan goodies is quite the Xmas gift! ENTER HERE + check out the prize details. 1. LET THEM REST. If you want to dive fork-first into your pancakes seconds after they slide from your warm spatula, you will find your gf ancakes may not have perfectly "set" yet. Give them a good 5-10 minutes to set and the texture will be fluffier and those oast will bind together as they cool a bit. 2. GRIND FINE. When blending or processing your whole oats in your Vitamix or whatever tool you use, grind them as fine as possible. This leads to smoother texture pancakes. 3. POUR IT ON. 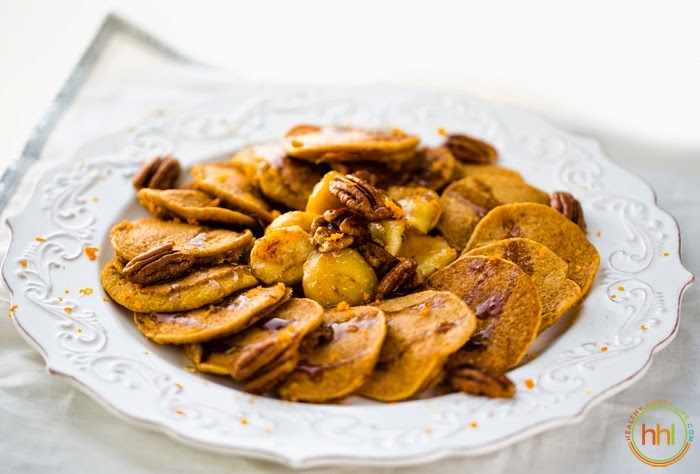 Gluten-free pancakes LOVE maple syrup. They crave that hint of moisture and soak in the flavor gloriously. Drizzle on the maple syrup with a heavy hand, because these pancakes can stand up to the syrup! Use grade B ample syrup, nothing fake please. ..and that last tip applies to all pancakes, I think. 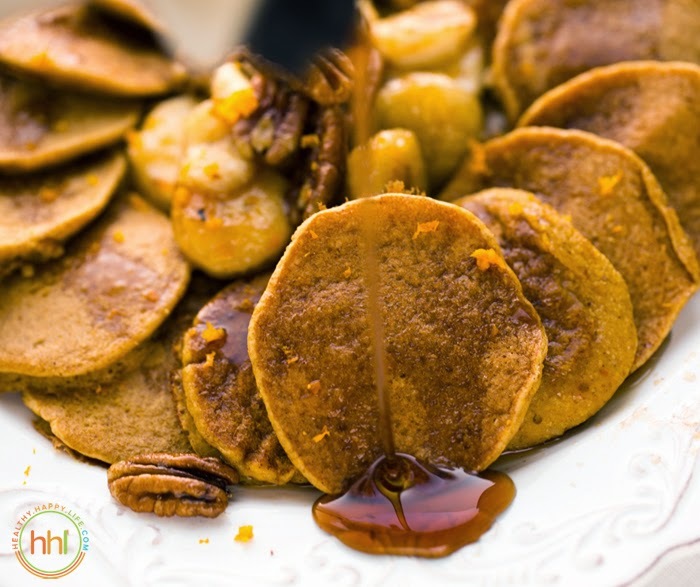 Like I said, LOTS of maple syrup..
Fluffy vegan and gluten free pancakes with flavors of spice, citrus, vanilla and pecan in every bite. Banana-Pecan Topping on the side. 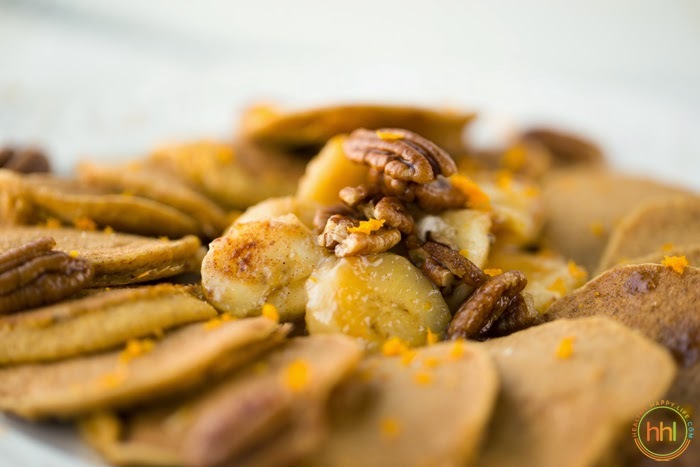 In a Vitamix or food processor, process the oats with the pecans to form a fine flour. Pour into a large mixing bowl. Warm a skillet over low heat while you prep the batter. This will help because your skillet will be evenly hot when ready to make your pancakes. Add the baking powder, salt, spices and citrus zest to the dry bowl. Stir. Then stir in the wet: pumpkin, citrus juice, maple syrup, non-dairy milk and vanilla extract. Stir well for a good two minutes to allow the oats to absorb the liquid and thicken the batter. You can use a hand mixer if desired, but not necessary. When your skillet is hot, add about 1 heaping tablespoon of batter to the pan for small sized pancakes. About two tablespoons for larger pancakes. Cook over medium heat for about 2 minutes, flip and cook for another 2 minutes. Pancakes should be easy to flip and remove from pan and slightly browned when ready. Continue with all the batter. 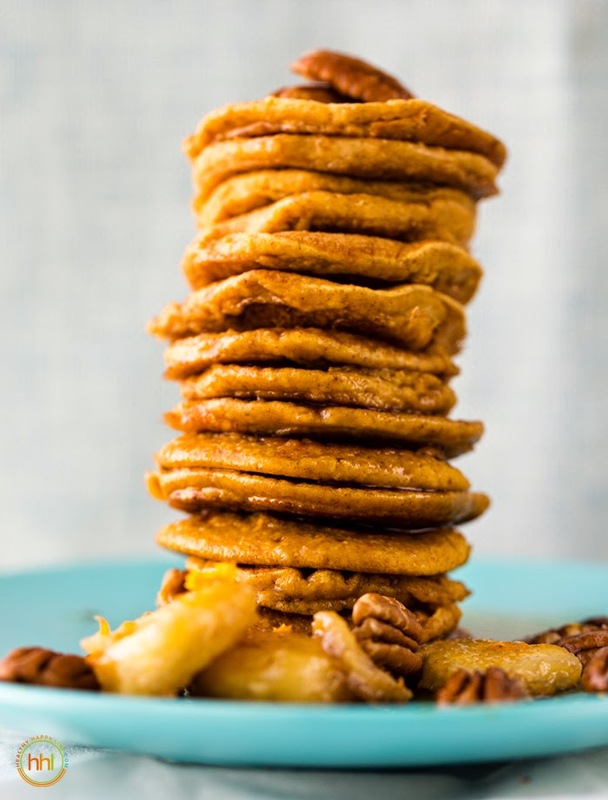 When pancakes are done, allow them to cool on a plate 5-10 minutes before serving. 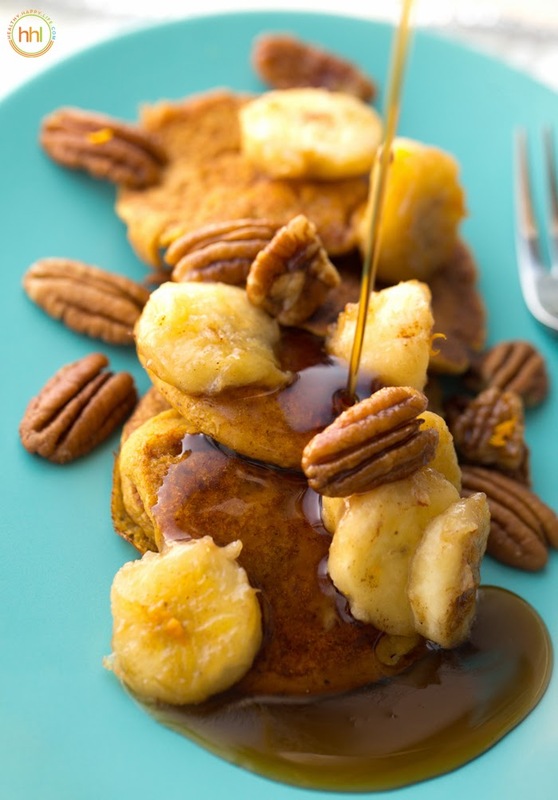 While they are cooling you can whip up the banana-pecan topping. Topping: While the pan is still on medium and still hot, add the coconut oil, pacan and bananas. Toss them around in the oil. Then add the maple and cinnamon. Saute for about 2 minutes, just until the bananas soften and lightly brown and caramelize. Remove topping from pan and pour onto serving plate. Arrange pancakes in a pretty design around the topping. On top: Add fresh citrus zest to serve. Plentiful maple syrup too! psst.. that giveaway I mentioned, just wanted to remind you again! Enter here.